Introduction Breast cancer represents about one-third of all cancer diagnoses and accounts for about 15% of cancer deaths in women. Many of these patients experience depression, anxiety, sleep disturbances and cognitive dysfunction. This may adversely affect quality of life and also contribute to morbidity and mortality. Melatonin is a regulatory circadian hormone having, among others, a hypnotic and an antidepressive effect. It has very low toxicity and very few adverse effects compared with the more commonly used antidepressants and hypnotics. Methods and analysis The objective of this double-blind, randomised, placebo-controlled trial is to investigate whether treatment with oral melatonin has a prophylactic or ameliorating effect on depressive symptoms, anxiety, sleep disturbances and cognitive dysfunction in women with breast cancer. Furthermore, the authors will examine whether a specific clock-gene, PER3, is correlated with an increased risk of depressive symptoms, sleep disturbances or cognitive dysfunction. The MELODY trial is a prospective double-blinded, randomised, placebo-controlled trial in which the authors intend to include 260 patients. The primary outcome is depressive symptoms measured by the Major Depression Inventory. The secondary outcomes are anxiety measured by a Visual Analogue Scale, total sleep time, sleep efficiency, sleep latency and periods awake measured by actigraphy and changes in cognitive function measured by a neuropsychological test battery. Tertiary outcomes are fatigue, pain, well-being and sleep quality/quantity measured by Visual Analogue Scale and sleep diary and sleepiness measured by the Karolinska Sleepiness Scale. The PER3 genotype is also to be determined in blood samples. This is a protocol article on the MELODY trial. The objective of this double-blind randomized, placebo-controlled trial is to investigate whether daily treatment with 6 mg oral melatonin has a prophylactic or ameliorating effect on depressive symptoms, anxiety, sleep disturbances and cognitive dysfunction in women with breast cancer. Furthermore to examine whether a specific clock-gene PER3 is correlated with an increased risk of depressive symptoms, sleep disturbances or cognitive dysfunction. MELODY (The effect of MELatOnin on Depression, anxietY, cognitive function and sleep disturbances in breast cancer patients) is a prospective double-blinded, randomised, placebo-controlled trial in which we intend to include 260 patients undergoing surgery for breast cancer at Herlev University Hospital in Copenhagen, Denmark. If target sample size is not being adequately achieved, other centres/hospitals in Denmark will be invited to participate. The objective is to investigate whether treatment with oral melatonin has a prophylactic or ameliorating effect on depressive symptoms, anxiety, sleep disturbances and cognitive dysfunction in women with breast cancer. Furthermore, we will examine whether a specific clock-gene, PER3, is correlated with an increased risk of depressive symptoms, sleep disturbances or cognitive dysfunction. Patients in the intervention group will receive 6 mg oral melatonin daily 1 h before bedtime for 1 week preoperatively to 12 weeks postoperatively. Patients in the control group will receive placebo. The melatonin/placebo will be supplied from Pharma Nord ApS (Vejle, Denmark), and the tablets (melatonin/placebo) are physically identical. Approximately 1 week preoperatively patients are individually assessed and screened for inclusion (table 1). This includes a Mini Mental State Examination, a neuropsychological test with the ISPOCD test battery13 and the Major Depression Inventory (MDI).14–16 Hereafter, patients will on a daily basis fill out Visual Analogue Scales (VAS) regarding anxiety, fatigue, pain, general well-being and sleep, complete a sleep diary and fill out the Karolinska Sleepiness Scale (KSS). An Actigraph will be mounted on the wrist and worn continuously until 2 weeks postoperatively. Patients will be randomised to either 6 mg melatonin or placebo. Patients will be instructed to take their medicine every evening at 21:00–22:00 and continue with this for 13 weeks. A blood sample will be collected for the analysis of PER3 genotype. A visit is scheduled 2 weeks postoperatively where patients are tested with the ISPOCD test battery and the MDI. At this time, the Actigraph will be taken off. During the last 10 weeks of the study, patients will be assessed with the MDI twice and every 2 weeks fill out VAS regarding anxiety, fatigue, pain, general well-being and sleep, complete a sleep diary and fill out the KSS. At the final visit, 12 weeks postoperatively patients will be tested with the ISPOCD test battery and the MDI. To ensure compliance and promote participant retention and follow-up, patients will throughout the whole study period of 13 weeks be contacted by telephone seven times to remind them to fill out VAS, sleep diary, KSS and MDI at appropriate times, to remind them to take their tablets daily, to ask about adverse reactions and to ask about diagnosis of depression since the last contact. During the trial, patients who experience serious peri- or postoperative complications/events causing unexpected morbidity or pain during the first postoperative days (ie, cardiopulmonary complications (myocardial infarction, serious arrhythmia, pulmonary oedema), thromboembolic complications (deep venous thrombosis, pulmonary embolism) and wound infection (with fever and elevated white blood cells and C reactive protein)), will be excluded. No further data will be collected on these patients after they are excluded; previously collected data will not be analysed, and the patients will not continue the trial medication. The goal with medicine compliance is a minimum of 75% compliance in the first 3 weeks and 50% for the rest of the study period. Patients will be excluded if they at the visit 2 weeks postoperatively have not taken at least 75% of the study medication. No further data will be collected and the patients will not continue the trial medication. Patients who have not taken at least 50% of the trial medication at the last visit will not be analysed on the long-term effect variables. Patients will be instructed to bring all the study medication (open and closed blister packets) with them at every visit to control compliance. All potential, included and randomised patients will be accounted for in a screening log, in an identification list, in the CONSORT trial profile and in a baseline data table. Patients who have provided written and informed consent preceding inclusion and who meet all the inclusion criteria and none of the exclusion criteria are randomised to either melatonin 6 mg or placebo. Inclusion and randomisation is done 1 week preoperatively. The randomisation is based on blocks of six. The randomisation list is computer generated using dedicated software (http://www.randomization.com). To ensure that the randomisation list is not known to the investigator, this procedure is completed by the pharmacy who receives the medicine directly from Pharma Nord ApS. In case of dropouts leading to <120 patients in each group, the study will include new blocks of six patients to ensure randomisation and balance between the two groups. Data are collected on individual paper case report forms (CRFs), and data will be stored for 15 years and then destroyed. Data from these CRFs will be transferred as double data entry to a database. In this database, patients are coded with a patient number and the database is saved on the hospitals computer server to ensure maximum security. Spot checks to validate data transfer from the CRFs to the electronic database will be completed by the Good Clinical Practice Unit. Due to melatonins relative non-toxicity shown in both animal and human studies and due to the fact that prolonged treatment with melatonin or melatonin receptor agonists have not shown any serious adverse effects, no Data Monitoring Committee is initiated and no interim analyses have been planned in the course of the study. Throughout the trial, both the sponsor/investigator, who informs the patient and the patient herself, will be blinded. A code breach will occur if an unexpected event arises in relation to the surgical procedure and/or the postoperative period where there is a reasonable probability of an adverse reaction. Unexpected events do not include procedure-related surgical/medical/anaesthetic complications. Code breach is possible without prior contact to sponsor/investigator. The risk of early trial termination is not existent. The summary of product characteristics for melatonin will be used as a reference document. The following known, usual side effects (1%–10%) and non-usual side effects (0.1%–1%) will not be registered as adverse events: light headache, light nausea, dyspepsia, minor symptoms of sleepiness and light morning drowsiness. Furthermore, complications in relation to surgery will neither be registered as adverse events. All adverse events will be registered and reported to the Danish Medicines Agency and the local ethics committee in the final report. All serious adverse events will be reported to the local ethics committee in an annual report together with a report on patient safety. All serious adverse reactions will be reported to the Danish Medicines Agency in an annual report together with a report on patient safety. The summary of product characteristics for melatonin will be used to judge whether a serious adverse reaction is expected/unexpected and thereby a possible sudden unexpected serious adverse reaction. The sponsor/investigator will make sure that all information about sudden unexpected serious adverse reactions, that are lethal or life threatening, will be registered and reported to the Danish Medicines Agency as soon as possible and at the latest 7 days after sponsor/investigator has received knowledge of such a reaction. At the latest 8 days after this reporting, sponsor/investigator will inform the Danish Medicines Agency of the follow-up. All other sudden unexpected serious adverse reactions will be reported to the Danish Medicines Agency at the latest 15 days after sponsor/investigator has gained knowledge of these. In these situations, the patient will be followed until the reaction has terminated—either via contact with the sponsor/investigator or via the outpatient clinic at the hospital. Melatonin is a hormone that is produced at night in the corpus pineale in a rhythmical pattern and controlled by an endogenous clock in the suprachiasmatic nucleus of the hypothalamus.17 Its main function is to synchronise the circadian rhythm.17 Melatonin is mostly known for its role as a circadian hormone, but it also has known sedative,18 19 anxiolytic,18 19 analgesic,20 21 antihypertensive,22 23 non-inflammatory24 and oncostatic effects.25–27 Melatonin has a possible antidepressive effect28–34 probably based on its effect on the central circadian regulation35 and an effect on improving cognitive function.36 Figure 1 shows the complexity of the relationship between breast cancer and depression and the possible attack points of melatonin. Previous studies have shown that certain genes, called clock-genes, have a role in regulating circadian rhythms and sleep in humans.51 A coding region in the clock-gene PER3, which is repeated in either 4 or 5 units, has been coupled to various phenotypical traits, A or B people, sleep diseases,52–54 affective disorders,55 56 cognitive function after sleep deprivation,54 57 and in one study,58 a relationship was found between the 5/5 og 4/5 genotype of the PER3 gene and breast cancer. We would like to investigate whether sleep quality, cognitive function or depressive symptoms are correlated with any of these three PER3 genotypes. The study will be performed in agreement with the Helsinki II declaration and law 503 of 1992 about the Scientific Ethics Committee System and is approved by the local ethics committee (H-4-2011-007). The study has also been approved by the Danish Medicines Agency (EudraCT nr. 2010-022460-12) and the Danish Data Protection Agency (2007-58-0015/HEH.750.89-12). The project is registered on http://www.clinicaltrials.gov as recommended by the International Committee of Medical Journal Editors—clinicaltrials.gov identifier: NCT01355523. The Good Clinical Practice Unit at Copenhagen University will oversee the trial and conduct trial audit periodically. All authors will have direct access to data during and after the trial. Furthermore, the sponsor/investigator will allow direct access to source data/documents, including patient charts, at monitoring, audit and/or inspection from the Danish Medicines Agency, the Good Clinical Practice Unit or from health authorities from other countries. The primary, secondary and tertiary effect parameters of the trial can be seen in table 2. Major Depression Inventory (MDI) is a self-rating scale including 12 questions. The questionnaire is already well documented in a Danish population.14 The questions cover the 10 ICD-10 questions for depression, and the symptoms are identical with the DSM-IV major depression diagnosis apart from one symptom, low self-esteem (question 4), which in DSM-IV is incorporated in the question about guilt (question 5). The MDI includes 10 items, where items 8 and 10 are divided into two sub-questions a and b. For items 8 and 10, the highest score of questions a and b is included. The individual items are measured on a 6-point Likert scale with graduations depending on the extent of the symptom the last 14 days, 0 (the symptom has not been present) till 5 (the symptom has been present continuously). Actigraphy is a well-known, non-invasive method to objectively measure sleep. Using an actigraph, activity levels are registered by a wrist-worn mini-computer. This method which does not disturb the patients' sleep has been used for many years59 and also in the postoperative setting.60 It has been shown that actigraphy has a high sensitivity and specificity for detecting sleep start, sleep periods and awakenings.59 The gold standard for measuring sleep is polysomnography. Actigraphy has a high specificity for detecting whether the patient is asleep or awake but cannot differentiate between sleep stages and score REM sleep. The cognitive function of the patients will be tested preoperatively and at 2 weeks and 3 months postoperatively. The test battery consists of four validated tests: the Visual Verbal Learning Test, the Stroop Colour-Word Test, the Letter-Digit Coding Test and the Concept Shifting Task. A subjective feeling of anxiety will be registered on a VAS going from ‘no anxiety’ to ‘worst possible anxiety’. Measurements will take place daily for the first 3 weeks of the study and every 2 weeks for the last 10 weeks. Subjective sleep quality will be registered on a VAS going from ‘best possible sleep’ equivalent to 0 mm to ‘worst possible sleep’ equivalent to 100 mm. Patients will also fill out VAS regarding general well-being, fatigue and pain. Measurements will take place at the same time as for anxiety. Age, weight, height, menopausal status, educational level, cohabitation status, work market affiliation, household income, number of children/number of children living at home, smoking habits, American Society of Anesthesiologists (ASA) class, duration of surgery, the size of the incision, consumption of analgesics postoperatively and which postoperative oncological treatment each patient receives after surgery. The sample size estimation is based on a conservative estimate of the incidence of depression of 30% in breast cancer patients7 with a reduction to 15% with melatonin treatment. With a power of 80%, a risk of type I error of 5% and a risk of type II error of 20%, we should include 120 patients in each group receiving melatonin or placebo. We have chosen to include 130 patients in each group. Statistical analyses will be done using SPSS V.18.0. Regarding our primary outcome mean MDI total scores and prevalences of ICD-10 mild, moderate and severe depression will be calculated for both samples. Normality of the data will be tested by one sample Kolmogorov–Smirnov test and parametric or non-parametric statistics will be used accordingly. The two groups will be compared by Fisher's exact test for the primary outcome. Paired Student t test or Wilcoxon test will be used for intragroup comparisons and unpaired Student t test or Mann–Whitney's test for intergroup comparisons. For repeated measures, Friedman test or an analysis of variance will be used when appropriate. For comparing anxiety by VAS and sleep architecture (objective data from the actigraph), we will do intergroup comparisons with Mann–Whitney's test and intragroup comparisons using the Wilcoxon signed-rank test. For analysing postoperative cognitive dysfunction (POCD) in the two groups, we will use 2×2 tables and a Fisher's exact test. Patients will be defined as having POCD if two of the seven Z-scores in individual test or the combined Z-score are ≥1.96.13 Analysis of variance will be used to analyse the two groups and the specific Z-scores for the seven subtests and the combined Z-scores. A Bonferroni correction will be made when performing multiple comparisons. For analyses of correlation between PER3 genotype and sleep, cognitive function and depressive symptoms, a logistic regression analysis will be used. For the subjective parameters fatigue, pain, general well-being and sleep quality/quantity measured by VAS and sleepiness by KSS, we will do intergroup comparisons with the Mann–Whitney test and intragroup comparisons using the Wilcoxon signed-rank test. We plan to do intention-to-treat as well as per protocol analyses. In general, p<0.05 will be considered statistically significant. 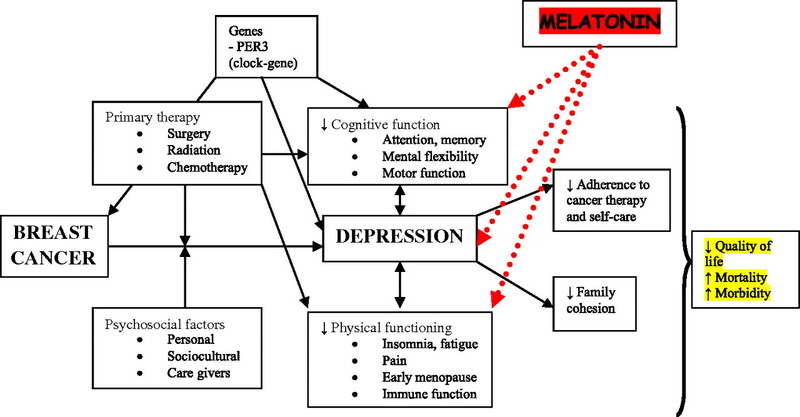 There is a complex relationship between depression and breast cancer with influence from various factors (figure 1). Due to the high frequencies of depression, anxiety, sleep disturbances and cognitive dysfunction in patients with breast cancer, a high interest is found in preventing these co-morbid symptoms. Studies have shown that treating anxiety and depression in these patients with breast cancer improves their quality of life, leads to a higher completion of adjuvant therapy and extends their lifetime.68 77 78 Therefore, it is important to optimise the treatment of these symptoms. Sleep disturbances are a frequent problem in cancer patients.89 90 Compared with other types of cancer, breast cancer is associated with an exceptionally high rate of reduced sleep quality10 89 which can be found even many years after end of treatment.8 The estimated prevalence of sleep problems among patients with breast cancer is between 38% and 61%,10 89 91 92 and it may reduce quality of life in this group of patients.91 93 About 30% of patients with breast cancer take hypnotics10 89 92 leading to a potential dependency problem and it is therefore important to focus on treatments with less adverse effects. In other settings, some studies have shown that melatonin can attenuate cognitive dysfunction,36 102 103 and this mechanism together with the general improvement of sleep could be beneficial on cognitive disturbances in this specific group of patients. Since there is no specific knowledge on this topic with regard to breast cancer, it is necessary to investigate whether the development of cognitive problems can be prevented by melatonin treatment. In conclusion, we hope, with this project, to decrease the occurrence of depression, anxiety, sleep disturbances and cognitive dysfunction in patients with breast cancer and in a larger perspective reduce morbidity and mortality and improve quality of life for these patients. With regard to genetics, this project could lead to the possibility of being able to detect women with a higher risk of developing the above mentioned problems and then give indication for selective prophylactic treatment. The diversity of melatonin's physiological functions and treatment effects are continuously being investigated in both animal and human studies. To date, the effect of melatonin in a breast cancer population with the above-mentioned indications has not yet been studied.
. Cancer statistics, 2001. CA Cancer J Clin 2001;51:15–36.
. Major depression after breast cancer: a review of epidemiology and treatment. Gen Hosp Psychiatry 2008;30:112–26.
. Depression and anxiety in women with early breast cancer: five year observational cohort study. BMJ 2005;330:702–5.
. Prevalence, severity, and correlates of sleep-wake disturbances in long-term breast cancer survivors. J Pain Symptom Manage 2010;39:535–47.
. Cognitive function and quality of life after surgery for early breast cancer in North Jutland, Denmark. Acta Oncol 2009;48:532–40.
. Prevalence, clinical characteristics, and risk factors for insomnia in the context of breast cancer. Sleep 2001;24:583–90.
. Prevalence of depression in patients with cancer. J Natl Cancer Inst Monogr 2004;32:57–71.
. Multiple predictors of health-related quality of life in early stage breast cancer. Data from a year follow-up study compared with the general population. Qual Life Res 2005;14:1813–23.
. Long-term postoperative cognitive dysfunction in the elderly ISPOCD1 study. ISPOCD investigators. International Study of Post-Operative Cognitive Dysfunction. Lancet 1998;351:857–61.
. Prevalence of major depression and stress indicators in the Danish general population. Acta Psychiatr Scand 2004;109:96–103.
. The sensitivity and specificity of the Major Depression Inventory, using the Present State Examination as the index of diagnostic validity. J Affect Disord 2001;66:159–64.
. The internal and external validity of the Major Depression Inventory in measuring severity of depressive states. Psychol Med 2003;33:351–6.
. The basic physiology and pathophysiology of melatonin. Sleep Med Rev 2005;9:11–24.
. Perioperative effects of melatonin and midazolam premedication on sedation, orientation, anxiety scores and psychomotor performance. Eur J Anaesthesiol 2004;21:553–7.
. Premedication with melatonin: a double-blind, placebo-controlled comparison with midazolam. Br J Anaesth 1999;82:875–80.
. The clinical impact of preoperative melatonin on postoperative outcomes in patients undergoing abdominal hysterectomy. Anesth Analg 2007;105:1263–71.
. Potential use of melatonergic drugs in analgesia: mechanisms of action. Brain Res Bull 2010;81:362–71.
. Prolonged melatonin administration decreases nocturnal blood pressure in women. Am J Hypertens 2005;18:1614–18.
. The effects of oral melatonin on the autonomic function in healthy subjects. Psychiatry Clin Neurosci 2001;55:299–300.
. The immunotherapeutic potential of melatonin. Expert Opin Investig Drugs 2001;10:467–76.
. Melatonin: from basic research to cancer treatment clinics. J Clin Oncol 2002;20:2575–601.
. Mechanisms of cancer inhibition by melatonin. J Pineal Res 2004;37:213–14.
. Melatonin and breast cancer: cellular mechanisms, clinical studies and future perspectives. Expert Rev Mol Med 2009;11:e5.
. Effects of melatonin in perimenopausal and menopausal women: our personal experience. Ann N Y Acad Sci 2005;1057:393–402.
. The effects of melatonin on the behavioural disturbances induced by chronic mild stress in C3H/He mice. Behav Pharmacol 1999;10:73–83.
. Novel melatonin-based therapies: potential advances in the treatment of major depression. Lancet 2011;378:621–31.
. A randomized double-blind placebo-controlled trial of treatment as usual plus exogenous slow-release melatonin (6 mg) or placebo for sleep disturbance and depressed mood. Int Clin Psychopharmacol 2010;25:132–42.
. Effect of melatonin administration on sleep, behavioral disorders and hypnotic drug discontinuation in the elderly: a randomized, double-blind, placebo-controlled study. Aging Clin Exp Res 2009;21:38–42.
. Antidepressant action of melatonin in the treatment of Delayed Sleep Phase Syndrome. Sleep Med 2010;11:131–6.
. Pathophysiology of depression: role of sleep and the melatonergic system. Psychiatry Res 2009;165:201–14.
. Possible therapeutic value of melatonin in mild cognitive impairment: a retrospective study. J Pineal Res 2007;43:404–9.
. General anesthesia for surgery influences melatonin and cortisol levels. World J Surg 2005;29:826–9.
. The influence of anaesthesia and surgery on the circadian rhythm of melatonin. Acta Anaesthesiol Scand 2002;46:30–6.
. Disturbances in melatonin and core body temperature circadian rhythms after minimal invasive surgery. Acta Anaesthesiol Scand 2007;51:1099–106.
. Night work and breast cancer risk: a systematic review and meta-analysis. Eur J Cancer 2005;41:2023–32.
. The effects of oral melatonin on skin color and on the release of pituitary hormones. J Clin Endocrinol Metab 1977;45:768–74.
. The use of high-dose melatonin in liver resection is safe: first clinical experience. J Pineal Res 2011;50:381–8.
. Randomized, double-blind clinical trial, controlled with placebo, of the toxicology of chronic melatonin treatment. J Pineal Res 2000;29:193–200.
. Maternal and developmental toxicity evaluation of melatonin administered orally to pregnant Sprague-Dawley rats. Toxicol Sci 1999;50:271–9.
. Acute pharmacology of melatonin. Nature 1967;214:919–20.
. Melatonin and parkinsonism. Lancet 1973;1:271.
. Effects of low oral doses of melatonin, given 2-4 hours before habitual bedtime, on sleep in normal young humans. Sleep 1996;19:423–31.
. Melatonin reduces oxidative stress in surgical neonates. J Pediatr Surg 2004;39:184–9.
. Effects of melatonin treatment in septic newborns. Pediatr Res 2001;50:756–60.
. Efficacy and safety of exogenous melatonin for secondary sleep disorders and sleep disorders accompanying sleep restriction: meta-analysis. BMJ 2006;332:385–93.
. PERIOD3, circadian phenotypes, and sleep homeostasis. Sleep Med Rev 2010;14:151–60.
. A length polymorphism in the circadian clock gene Per3 is linked to delayed sleep phase syndrome and extreme diurnal preference. Sleep 2003;26:413–15.
. Circadian clock-related polymorphisms in seasonal affective disorder and their relevance to diurnal preference. Neuropsychopharmacology 2003;28:734–9.
. PER3 polymorphism predicts sleep structure and waking performance. Curr Biol 2007;17:613–18.
. Suggestive evidence for association of the circadian genes PERIOD3 and ARNTL with bipolar disorder. Am J Med Genet B Neuropsychiatr Genet 2006;141B:234–41.
. How do genes exert their role? Period 3 gene variants and possible influences on mood disorder phenotypes. Eur Neuropsychopharmacol 2007;17:587–94.
. Early morning executive functioning during sleep deprivation is compromised by a PERIOD3 polymorphism. Sleep 2008;31:1159–67.
. Period3 structural variation: a circadian biomarker associated with breast cancer in young women. Cancer Epidemiol Biomarkers Prev 2005;14:268–70.
. The role of actigraphy in the study of sleep and circadian rhythms. Sleep 2003;26:342–92.
. Computerized monitoring of physical activity and sleep in postoperative abdominal surgery patients. J Clin Monit Comput 1999;15:1–8.
. Automatic sleep/wake identification from wrist activity. Sleep 1992;15:461–9.
. Patterns of circadian activity rhythms and their relationships with fatigue and anxiety/depression in women treated with breast cancer adjuvant chemotherapy. Support Care Cancer 2010;18:105–14.
. Disrupted sleep the night before breast surgery is associated with increased postoperative pain. J Pain Symptom Manage 2009;37:352–62.
. Fatigue, sleep, and circadian rhythms prior to chemotherapy for breast cancer. Support Care Cancer 2006;14:201–9.
. Temporal interrelationships among fatigue, circadian rhythm and depression in breast cancer patients undergoing chemotherapy treatment. Support Care Cancer 2002;10:329–36.
. Subjective and objective sleepiness in the active individual. Int J Neurosci 1990;52:29–37.
. Depression in women with metastatic breast cancer: a review of the literature. Palliat Support Care 2008;6:377–87.
. Breast cancer and depression. Oncology 2004;18:1021–34.
. Depression as a prognostic factor for breast cancer mortality. Psychosomatics 2003;44:24–30.
. Influence of psychological response on survival in breast cancer: a population-based cohort study. Lancet 1999;354:1331–6.
. Depression as a predictor of disease progression and mortality in cancer patients: a meta-analysis. Cancer 2009;115:5349–61.
. Influence of psychiatric comorbidity on surgical mortality. Arch Surg 2010;145:947–53.
. Relationship of depression to patient satisfaction: findings from the barriers to breast cancer study. Breast Cancer Res Treat 2005;89:23–8.
. Depression and degree of acceptance of adjuvant cytotoxic drugs. Lancet 2000;356:1326–7.
. Depression is a risk factor for noncompliance with medical treatment: meta-analysis of the effects of anxiety and depression on patient adherence. Arch Intern Med 2000;160:2101–7.
. Quality of life, anxiety, and oncological factors: a follow-up study of breast cancer patients. Psychosomatics 2010;51:112–23.
. Decrease in depression symptoms is associated with longer survival in patients with metastatic breast cancer: a secondary analysis. J Clin Oncol 2011;29:413–20.
. Treatment of depressive symptoms in patients with early stage breast cancer undergoing adjuvant therapy. Breast Cancer Res Treat 2008;112:197–201.
. Treatment of depression in patients with breast cancer: a comparison between paroxetine and amitriptyline. Breast Cancer Res Treat 2001;70:1–10.
. Effect of paroxetine hydrochloride (Paxil) on fatigue and depression in breast cancer patients receiving chemotherapy. Breast Cancer Res Treat 2005;89:243–9.
. Pharmacological treatment of depression in cancer patients. A placebo-controlled study of mianserin. Br J Psychiatry 1996;169:440–3.
. A double-blind, multicenter, parallel-group study of paroxetine, desipramine, or placebo in breast cancer patients (stages I, II, III, and IV) with major depression. J Clin Psychiatry 2006;67:288–96.
. Effect of reboxetine on major depressive disorder in breast cancer patients: an open-label study. J Clin Psychiatry 2004;65:515–20.
. Fluoxetine versus placebo in advanced cancer outpatients: a double-blinded trial of the Hoosier Oncology Group. J Clin Oncol 2003;21:1937–43.
. Differential effects of paroxetine on fatigue and depression: a randomized, double-blind trial from the University of Rochester Cancer Center Community Clinical Oncology Program. J Clin Oncol 2003;21:4635–41.
. Diagnosis and treatment of depression in cancer patients. Oncology 1999;13:1293–301.
. Selective serotonin reuptake inhibitors and breast cancer mortality in women receiving tamoxifen: a population based cohort study. BMJ 2010;340:c693.
. Interactions between tamoxifen and antidepressants via cytochrome P450 2D6. J Clin Psychiatry 2009;70:1688–97.
. Sleep disturbance in cancer patients. Soc Sci Med 2002;54:1309–21.
. Insomnia in the context of cancer: a review of a neglected problem. J Clin Oncol 2001;19:895–908.
. Sleep and quality of life in breast cancer patients. J Pain Symptom Manage 2002;24:471–80.
. Sleep disturbances in women with metastatic breast cancer. Breast J 2002;8:362–70.
. An evaluation of the quality of life among long-term survivors of breast cancer. Breast Cancer Res Treat 1996;39:261–73.
. Sleep and psychopathology. Appl Prev Psychol 1996;5:211–24.
. Sleep and mood disorders. Sleep Med Rev 1997;1:45–56.
. Sleep disturbance and psychiatric disorders: a longitudinal epidemiological study of young adults. Biol Psychiatry 1996;39:411–18.
. Does sleep disturbance predict depression in elderly people? A study in inner London. Br J Gen Pract 1993;43:445–8.
. The relationship between fatigue and sleep in cancer patients: a review. Eur J Cancer Care (Engl) 2001;10:245–55.
. A longitudinal study of depression, pain, and stress as predictors of sleep disturbance among women with metastatic breast cancer. Biol Psychol 2007;75:37–44.
. ‘Chemobrain’ in breast carcinoma? : a prologue. Cancer 2004;101:466–75.
. Cognitive functioning in breast cancer survivors: a controlled comparison. Cancer 2009;115:1776–83.
. Melatonin maintains adult hippocampal neurogenesis and cognitive functions after irradiation. Prog Neurobiol 2010;90:60–8. Funding This work was supported by grants from the University of Copenhagen, the Aase and Ejnar Danielsens Foundation, the A P Møller Foundation for the Advancement of Medical Science, the Else and Mogens Wedell Wedellborgs Foundation, the Beckett Foundation, the Hede Nielsen Family Foundation, the Dagmar Marshalls Foundation and Manufacturer Einar Willumsen's Memorial Scholarship. These above-mentioned funders have had no influence on the study design, will have no influence on collection, management, analysis and interpretation of data, writing of the report or the decision to submit the report for publication. All these activities are done by the authors. Pharma Nord provided the melatonin and placebo tablets but had no influence on the study design and will have no influence on the interpretation of results. Contributors All authors have participated in making substantial contributions to conception and design, drafting the article or revising it critically for important intellectual content and all authors have approved the final version to be published.